Sets We Want: 2011 Upper Deck Conference Panic! Home » Football » Football Cards » Sets We Want: 2011 Upper Deck Conference Panic! For more than a year, sports channels have reported that expansion will inevitably result in four 16-team NCAA “super" conferences. In fact, on Tuesday, just about every sports news service reported that the Big-12 was all but dead, there would be a Pac-16 and Mizzou was on its way to the SEC. By that evening, doubts were shed on these stories. On Wednesday morning, the Big-12 was secure, the Pac-12 was happy with its members and the Missouri thing was a false alarm. It was oddly reminiscent of when these same sports news services reported last year that Missouri was on its way to the Big 10. Instead of reporting news, the media is trying to create news by forcing the creation of four “super" conferences. Who says the Pac-12, Big-10, ACC and SEC even want to grow? Wouldn't it be ironic if the media's reporting of booster speculation is what's actually driving conference expansion? In view of this, I have developed a parody card set: 2011 Upper Deck Conference Panic! I've also taken the liberty of drafting a faux press release. Because, as everyone knows, news isn't generated from reporting any more, it's created from rumors and gleaned from press releases. Given that, I am sure this potential parody product is inevitable. From the creative team that brought you 2011 Bowman Lockout Football comes an exciting new product: 2011 Upper Deck Conference Panic!. LAW OF CARDS PARODY (ST LOUIS) - Based on the success of Upper Deck's collegiate products focused on North Carolina, Texas and Oklahoma, Upper Deck has announced plans for a new set of compelling cards that capture the same excitement and panic surrounding conference expansion. “The NCAA conference landscape is changing," said an Upper Deck spokesperson. “And with teams abandoning the conferences they built, a batch of new memorabilia has been created, while other memorabilia will become collector's items. For example, Syracuse uniforms with Big East symbols will soon be a thing of the past. This will only make them more desirable and collectible to those who can't move past their college years. Perfect material for relic cards! Fans will line up to be the first to own ACC-sanctioned Syracuse uniforms. More relic cards! With Panic! we capture both the old and new memorabilia market in one product." Focusing on this theme, Panic! is filled with unique patch and relic cards. The spokesperson continued, “When Nebraska joined the Big Ten, the Big 12 symbol on the hardwood at the Bob Devaney Sports Center became obsolete. We bought the hardwood, cut it up, and made some great, meaningful relic cards. The symbol was so large (it was the BIG 12 after all) that the cards are numbered to 10,000, ensuring that every box of Panic! will contain at least one of these keepsakes. 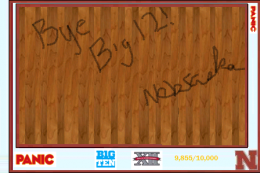 Not that many people may be familiar with Nebraska basketball, but we're looking forward to doing the same with the Carrier Dome and the Big East symbol in Panic! 2014 as well." “The mascot patch autograph is another unique feature in Panic!" another Upper Deck spokesperson said. “There was some resistance, but we've secured patch cards from Herbie the Husker of Nebraska fame, the Super Frog from TCU, and more. From Colorado we were able to not only snag a patch from their costumed mascot Chip, but were also able to steal patches of real fur from their buffalo, Ralphie! It`s the first scratch and sniff relic card on the market." “What we found most amusing about creating Panic! was our recognition of how each conference's membership had very little to do with the conference name," said the head of Quality Control at Upper Deck. “We hired some of the smartest fact checkers from the best Ivy League schools. The problem with these Ivy League folks, though, is that while they were in college, they tended to ignore sports and everything else about the real world in favor of studying. So, during the process, a number of seemingly inconsistent concepts that most college sports fan just accept were explained to us. My three favorites come from two of our fact checkers from Harvard and Yale." The fact checker from Harvard pointed out, “Are you aware that the Big 12 has ten teams this year, and will have nine next year? And, worse than that, the Big Ten has had eleven teams for the last 20 years? And now it has 12 members? Goes to show you what a Northwestern degree is worth if they can't even add." The fact checker from Yale lectured that, “This can't be right. The P in PAC-12 stands for Pacific. Last time I checked Colorado was not by the Pacific. But the PAC-10 invited them to be members? And I used to think you had to know some geography before going to Stanford." This checker also noted, “Wait, I thought Texas A&M was bad being included in the ­South Eastern Conference. At least they got the South part right. How the heck does Texas Christian University get classified as a Big East school? TCU is not big and it's not in the East. And what the heck is the University of Texas doing contemplating going to the Pac-10 or 12 or 16 or whatever it is? Do Texans think that big body of water that Texas touches is the Pacific? It's the Gulf of Mexico people! I mean, jeez! What do they teach the kids in Texas anyway?" The most compelling feature of Panic! is the sheer number error cards. “When we started putting the collection together, we wanted to be the first to get it out there, so we listened to the news and made cards about whatever was reported," said a fictitious Upper Deck employee who asked to remain anonymous. “A number of those cards accidentally made it through our quality control. But given the sheer confusion and ever-changing chaos, other mistakes were bound to occur down the line." Some of the remarkable error cards to look for include Mizzou SEC and Big 10 cards, as well as Oklahoma, Oklahoma State, Texas Tech and Texas cards for the Pac-16, a conference that does not even exist. Yet. The highlight of the error cards are the Sam Bradford Oklahoma autographs. As Bradford's spokesperson stated, “Well, Sam was in the Upper Deck offices the day it looked like Oklahoma was joining the Pac-12, so he was gracious enough to sign a number of cards for the product. Halfway through the signing, someone realized he was signing the old Pac-10 cards. Rather than waste perfectly good Bradford autographs, we gave him the Pac-12 cards to sign as well. Then, someone realized that since Oklahoma and three other teams were joining the Pac-12 that it would be the Pac-16, so he suggested we get together and sign Pac-16 cards too. It was only after he left was it reported that Oklahoma was going to stay in the Big 12." When asked about the Bradford errors, another Upper Deck spokesperson commented, “I'm not sure how all three error variations made it into the set, but they certainly are good collector's items." Other cards of note include the Titanic inserts which feature the autographs of the Big East and Big 12 commissioners. These cards are designed to resemble the ill-fated Titanic, but have one of the largest surfaces for autographs. “I'm not sure the commissioners actually read the back of the cards," another fictitious Upper Deck employee who wished to remain anonymous said, “because the cards predict the imminent demise of their conferences. It makes for a great keepsake, though!" Panic! will be hits stores this week. Hobby boxes are $64. It is unclear what blaster packs will cost, but depending on who your source is, it's either $10, $12 or $16. UPDATE: After this press release was issued, Stanford, Northwestern and six universities from Texas, including the University of Texas, were angered by the comments made by our Ivy League fact checkers. So next year, all eight schools will join the Ivy League schools to create the first surprise “super" conference. As a defensive lineman for Stanford said, “We may not know what states touch the Pacific Ocean, but I can sure give you the exact location I'm going to bury those Ivy League quarterbacks--in the backfield."